The 'next Miyazaki' is an inherently troublesome tag that inevitably gets dragged out by critics who have a limited understanding of the anime scene. It's a redundant comparison for a variety of reasons, not least because there literally is the next Miyazaki, and his name is Goro (responsible for the mediocre Tales of Earthsea and the upcoming From Up on Poppy Hill). As a number of interesting, inventive and deeply individual anime auteurs emerged in the last ten years - including Satoshi Kon (whose fruitful career was tragically cut short) and Mamoru Hosoda - it was, however, a descriptor that gained an unfortunate prominence in Western critical discussion. It's also a tag that is often used to describe director Makoto Shinkai, and he hasn't made it easier to shake it with his third feature film The Children Who Chase Voices from Deep Below. After gaining attention for almost single-handedly illustrating his short debut Voices from a Distant Star, he has gone on to create increasingly impressive features (The Place Promised in Our Early Days and the excellent 5cm per Second) while consistently displaying a distaste for monosyllabic titles. CWCVFDB (let's refer to it as CWC from now on) is a thoughtful and thematically adventurous tale, yet it's also one where Ghibli comparisons are difficult to avoid. 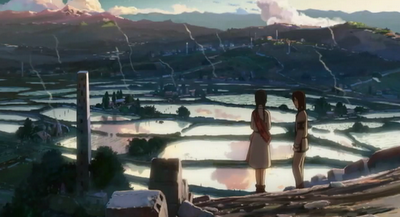 From majestic mythical creatures and themes of environmental decay through elaborate flying machines (admittedly something Makoto-san has been fond of since the outset) and young female protagonists, CWC often bears more than a passing resemblance to the likes of Princess Mononoke and Laputa: Castle in the Sky. There are even seemingly overt homages, including a sequence echoing Laputa where characters fall a great distance, illuminated only by a glowing necklace. Shinkai's own voice, however, ultimately dominates. The story begins in a rural Japanese village, where young Asuna is living with her mother a number of years after her father's death. With her mother working largely absent due to work commitments, Asuna spends her time engrossed in school work, household chores and heading into the woods to test her homemade radio. One day, she runs into a mysterious, bear-like creature on a railway bridge. She's saved from a potential mauling by Shun, a mysterious (yes, lots of elements in this film are steeped in mystery) boy who whisks her off to safety after defeating the creature. The film then spins off in fantastical directions, as Asuna and a group of accidental companions discover a mythical world known as Agartha underneath the surface of the Earth. CWC voices fits an awful lot of material into its 115 minute running time: the above synopsis barely scratches the surface (excuse the pun) of the narrative. Admittedly, the huge amount of material can sometimes adversely affect pacing and delivery. Not all the characters are given a real chance to breathe, and there's the odd contrivance or coincidence necessary to speed the plot towards its destination. However, CWC is a fascinating, engrossing film in spite of its unwieldy nature. The film has a grand scope, and there's a real sense of adventure and discovery throughout. While Asuna may not be the most original or proactive protagonist, other characters illustrate a surprising amount of depth. Mr. Morisaki - a mysterious (hi-ho!) substitute teacher who ends up unwillingly accompanying Asuna on her journey for entirely selfish reasons - is a particularly fascinating curveball: a flawed, deeply scarred individual who consistently rejects Asuna's search for a father figure. Neither hero nor villain, his interactions with Asuna are rarely predictable. Similarly, Shun - Shin's Agartha bound brother - is far from your wild-haired anime hero. Forgive me while I make a Miyazaki comparison: like in the best Ghibli works, the refusal to suggest a simplistic moral divide of good and evil is one of the film's great strengths. What is clear as the stories and characters progress is that each and every person in the film is, in their own way, struggling with loss or grief. This is ultimately the core thematic drive of the film. This is a film about life and death, and where mortality is constantly at forefront. There are blades that cut, guns that wound. No-one is immortal, not even Asuna's cute feline companion. As it emerges that Agartha hides the secret to resurrection, Shinkai explores the various ways the characters have coped with the loss of loved ones. It's a theme handled with care and thought, and regularly leads to moments of great emotion and insight. This is an adventure movie with a provocative and metaphorical core. I've gotten this far without mentioning the stunning art direction, which is to be expected from Shinkai. The characters are wonderfully realised, while Agartha itself proves a haunting, memorable place where beauty shines through even after centuries of destruction and decay. Even something as simple as the day and night divide is rendered beautifully through hypnotic skyscapes and shadowy vistas. Most impressive of all is the creature design. The variety of Quetzalcoatls and Gods that appear throughout are majestic yet melancholic creations, struggling to find a place in a world that no longer requires their presence. A bittersweet soundtrack is the perfect accompaniment to the visuals. The overall goal and ambition of CWC is so high that it's not surprising Shinkai occasionally struggles to keep up with it. Despite the pacing and basic storytelling issues that rear their head, CWC is a vibrant and engaging piece of work. It's a story that hides a great complexity, and is constantly backed-up by stunning hand-drawn animation. Mostly, it's the work of an ever-maturing anime auteur, that fits nicely with his earlier work while also standing out as something ambitious and new. While it may not be the perfect film, it's a welcome addition to Shinkai's impressive filmography and the anime scene. We can only wonder, with enthusiasm, what Makoto Shinkai will do next.